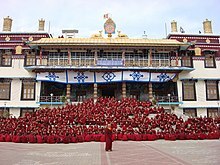 The Gelug (Wylie: dGe-Lugs-Pa) is the newest of the schools of Tibetan Buddhism. It was founded by Je Tsongkhapa (1357–1419), a philosopher and Tibetan religious leader. The first monastery he established was named Ganden (which gives an alternative name to the Gelug school, the Ganden-Pa), and to this day the Ganden Tripa is the nominal head of the school, though its most influential figure is the Dalai Lama. Allying themselves with the Mongols as a powerful patron, the Gelug emerged as the pre-eminent Buddhist school in Tibet and Mongolia since the end of the 16th century. The Gelug school was also called the "New Kadam", because it saw itself a revival of the Kadam school founded by Atisha. "Ganden" is the Tibetan rendition of the Sanskrit name "Tushita", the Pure land associated with Maitreya Buddha. At first, Tsongkhapa's school was called "Ganden Choluk" meaning "the Spiritual Lineage of Ganden". By taking the first syllable of 'Ganden' and the second of 'Choluk', this was abbreviated to "Galuk" and then modified to the more easily pronounced "Gelug". The Kadam school was a monastic tradition in Tibet, founded by Atisa’s chief disciple Dromtön in 1056 C.E. with the establishment of Reting Monastery. The school itself was based upon the Lamrim or “Graded Path,” approach synthesized by Atisa. While it had died out as an independent tradition by the 14th century, this lineage became the inspiration for the foundation of the Gelug-pa. The Gelug school was founded by Je Tsongkhapa, an eclectic Buddhist monk who traveled Tibet studying under Sakya, Kagyu and Nyingma teachers, such as the Sakya Master Rendawa (1349–1412) and the Dzogchen master Drupchen Lekyi Dorje. A great admirer of the Kadam school, Tsongkhapa merged the Kadam teachings of Lojong (mind training) and Lamrim (stages of the path) with the Sakya Tantric teachings. He also emphasized monasticism and a strict adherence to vinaya (monastic discipline). He combined this with extensive and unique writings on Madhyamaka, the Svatantrika-Prasaṅgika distinction, and Nagarjuna's philosophy of Śūnyatā (emptiness) that, in many ways, marked a turning point in the history of philosophy in Tibet. Tsongkhapa's Great Exposition of the Stages of the Path (Tib. Lam Rim Chenmo), is an exposition of his synthesis and one of the great works of the Gelug school. Tsongkhapa and his disciples founded Ganden monastery in 1409, which was followed by Drepung (1416) and Sera (1419), which became the "great three" Gelug monasteries. After the death of Tsongkhapa the order grew quickly, as it developed a reputation for strict adherence to monastic discipline and scholarship as well as tantric practice. Tsongkhapa had two principal disciples, Gyaltsab Je (1364—1432) and Khedrup Gelek Pelzang, 1st Panchen Lama (1385—1438). In 1577 Sonam Gyatso, who was considered to be the third incarnation of Gyalwa Gendün Drup, formed an alliance with the then most powerful Mongol leader, Altan Khan. As a result, Sonam Gyatso was designated as the 3rd Dalai Lama; "dalai" is a translation into Mongolian of the name "Gyatso" ocean, and Gyalwa Gendün Drup and Gendun Gyatso were posthumously recognized as the 1st and 2nd Dalai Lamas. Sonam Gyatso was very active in proselytizing among the Mongols, and the Gelug tradition was to become the main spiritual orientations of the Mongols in the ensuing centuries. This brought the Gelugpas powerful patrons who were to propel them to pre-eminence in Tibet. The Gelug-Mongol alliance was further strengthened as after Sonam Gyatso's death, his incarnation was found to be Altan Khan's great-grandson, the 4th Dalai Lama. Following violent strife among the sects of Tibetan Buddhism, the Gelug school emerged as the dominant one, with the military help of the Mongol Güshri Khan in 1642. According to Tibetan historian Samten Karmay, Sonam Chophel (1595–1657), treasurer of the Ganden Palace, was the prime architect of the Gelug's rise to political power. Later he received the title Desi [Wylie: sde-sris], meaning "Regent", which he would earn through his efforts to establish Gelugpa power. The fifth Dalai Lama was the first in his line to hold full political and spiritual power in Tibet. He established diplomatic relations with Qing Dynasty China, built the Potala Palace in Lhasa, institutionalized the Tibetan state Nechung oracle and welcomed Western missionaries. From the period of the 5th Dalai Lama in the 17th century, the Dalai Lamas held political control over central Tibet. The core leadership of this government was also referred to as the Ganden Phodrang. Scottish Botanist George Forrest, who witnessed the 1905 Tibetan Rebellion led by the Gelug Lamas, wrote that the majority of the people in the Mekong valley in Yunnan were Tibetan. According to his accounts, the Gelugpas were the dominant power in the region, with their Lamas effectively governing the area. Forrest said they used "force and fraud" to "terrorise the... peasantry". After the Incorporation of Tibet into the People's Republic of China, thousands of Tibetan monasteries were destroyed or damaged, and many Gelug monks, including the 14th Dalai Lama fled the country to India. The three major Gelug monastic colleges (Sera, Drepung and Ganden) were recreated in India. The Dalai Lama's current seat is Namgyal Monastery at Dharamshala, this monastery also maintains a branch monastery in New York City. The central teachings of the Gelug School are the Lamrim teachings of Tsongkhapa's Great Exposition of the Stages of the Path (Lamrim chenmo), which is based on the teachings of the Indian master Atiśa (c. 11th century) in A Lamp for the Path to Awakening. As the name indicates, this is a hierarchical model in which the practitioner accomplishes varying stages based on the classical Indian Mahayana model of the Bodhisattva "five paths and ten levels". One initially begins with the desire to seek a good rebirth, and then moves to seeking liberation for oneself (Sravaka motivation), and then to seeking Buddhahood so as to aid the liberation of others (Mahāyāna motivation), further adding Vajrayana methods to aid in the speedy attainment of Buddhahood. Higher motivations build on, but do not subvert the lower ones. The correct view of emptiness (shunyata). The correct view of emptiness is initially established through study and reasoning in order to ascertain if phenomena are the way they appear. Gelug texts contain many explanations to help one obtain a conceptual understanding of emptiness and to practice insight meditation (vipasyana). Gelug meditation includes an analytical kind of insight practice which is "the point-by-point contemplation of the logical arguments of the teachings, culminating in those for the voidness of self and all phenomena." The presentation of samatha and vipaśyanā in Tsongkhapa's Lamrim is also based on eighth-century Indian teacher Kamalaśīla's Bhāvanākrama, or ‘Stages of Meditation’. The highest view of emptiness is considered to be the Prāsangika Mādhyamika of Candrakirti, as interpreted by Tsongkhapa. Another important text of Gelug teachings is the Book of Kadam also known as the Kadam Emanation Scripture which includes teachings from Kadam masters like Atisha and Dromton. The tantric practices of the Gelug are also integrated into the stages of the path model by Tsongkhapa's The Great Exposition of Secret Mantra. This is combined with the yogas of Anuttarayoga Tantra iṣṭadevatā such as the Guhyasamāja, Cakrasaṃvara, Yamāntaka and Kālacakra tantras, where the key focus is the direct experience of the indivisible union of bliss and emptiness. There is a saying in the Gelug, 'If one is on the move it is Guhyasamāja. If one is still, it is Guhyasamāja. If one is meditating, it should be upon Guhyasamāja.' Therefore, whether one is engaged in study or practice, Guhyasamāja should be one's focus." Tsongkhapa also incorporated the tantric practice of the Six Yogas of Naropa, and Mahamudra, from the Dagpo Kagyu lineages. This tradition was continued by the first Panchen Lama, who composed A Root Text for the Precious Gelug/Kagyü Tradition of Mahamudra. The Gelug tradition also maintains Dzogchen teachings; Lozang Gyatso, 5th Dalai Lama (1617-1682), Thubten Gyatso, 13th Dalai Lama ( 1876-1933), and Tenzin Gyatso, 14th Dalai Lama are some Gelug-pa Dzogchen masters. [web 1] Likewise the practice of Chöd was taught by Gelug-pas such as Kyabje Zong Rinpoche. The Gelug school focuses on ethics and monastic discipline of the vinaya as the central plank of spiritual practice. In particular, the need to pursue spiritual practice in a graded, sequential manner is emphasized. Arguably, Gelug is the only school of vajrayāna Buddhism that prescribes monastic ordination as a necessary qualification and basis in its teachers (lamas / gurus). Lay people are usually not permitted to give initiations if there are teachers with monastic vows within close proximity. For each topic studied, the procedure is similar. The process starts with the heuristic memorization of the root text and sometimes of its commentaries. It continues with the interpretation of the root text through commentaries, and culminates in dialectical debate. After the study of the exoteric texts, a monk may then enter the esoteric study and practice of tantric texts, particularly the Guhyasamāja, Yamāntaka, and Cakrasamvara tantras. A monk who completes all his study may then attempt for a geshe degree, a rare and difficult title to obtain which can take 15 to 25 years to complete. Each Gelug monastery uses its own set of commentarial texts by different authors, known as monastic manuals (Tib. yigcha). The teachings of Tsongkhapa are seen as a protection against developing misconceptions in understanding and practice of Mahāyāna and Vajrayāna Buddhism. It is said that his true followers take The Great Exposition of the Stages of the Path as their heart teaching. The Great Exposition of the Stages of the Path was completely translated into English in a three volume set in 2004, under the title The Great Treatise on the Stages of the Path to Enlightenment. The translation took 13 years to complete, and was undertaken by scholars at the Tibetan Buddhist Learning Center, a non-sectarian Tibetan Buddhist educational center in Washington, New Jersey. A translation is also available in Vietnamese. In 2008, the 14th Dalai Lama Tenzin Gyatso gave a historical five day teaching on the text at Lehigh University. Tsongkhapa founded the monastery of Ganden in 1409 as his main seat. Drepung Monastery was founded by Jamyang Choje, Sera Monastery was founded by Chöje Shakya Yeshe and the Gyalwa Gendün Drup founded Tashi Lhunpo Monastery. Before the Chinese occupation Ganden and Sera each had about 5,000 monks, while Drepung housed over 7,000. Labrang Monastery, in Xiahe County in Gansu province (and in the traditional Tibetan province of Amdo), was founded in 1709 by the first Jamyang Zhaypa, Ngawang Tsondru. Many Gelug monasteries were built throughout Tibet as well as in China and Mongolia. Tsongkhapa had many students, his two main disciples being Gyaltsab Je (1364–1431) and Khedrup Gelek Pelzang, 1st Panchen Lama (1385–1438). Other outstanding disciples were Togden Jampal Gyatso, Jamyang Choje, Jamchenpa Sherap Senge and Gendün Drup, 1st Dalai Lama (1391–1474). After Tsongkhapa's passing, his teachings were held and spread by Gyaltsab Je and Khedrup Gelek Pelzang, who were his successors as abbots of Ganden Monastery. The lineage is still held by the Ganden Tripas – the throne-holders of Ganden Monastery – among whom the present holder is Thubten Nyima Lungtok Tenzin Norbu, the 102nd Ganden Tripa (and not, as often misunderstood, by the Dalai Lama). ^ Schaik, Sam van. Tibet: A History. Yale University Press 2011, page 129. ^ Ray, Reginald. Indestructible Truth: The Living Spirituality of Tibetan Buddhism, Ch. 8. ^ Bernstein. Tearing the Yellow Hat in Two: Conflict and Controversy in the Evolution of Gelugpa Buddhist Authority in Tibet, page 6. ^ Van Schaik. The Spirit of Tibetan Buddhism, p. 10. ^ Jinpa, Thupten. Self, Reality and Reason in Tibetan Philosophy. Routledge 2002, page 10. ^ a b c McKay 2003, p. 18. ^ a b c d e McKay 2003, p. 19. ^ Waddell, L. Austine (1895). The Buddhism of Tibet or Lamaism: with its Mystic Cults, Symbolism and Mythology, and in its Relation to Indian Buddhism. London. p. 63. OCLC 475275688. Archived from the original on 12 March 2008. And as we have seen in the previous chapter, the Ge-lug-pa sect in 1640, under its fifth Grand Lama, leapt into temporal power as the dominant sect in Tibet, and has ever since remained the Established Church for the country. ^ Short 2004, p. 108. ^ Harvey, Peter. An Introduction to Buddhism: Teachings, History and Practices (Introduction to Religion) 2nd Edition, page 208. ^ Harvey, Peter. An Introduction to Buddhism: Teachings, History and Practices (Introduction to Religion) 2nd Edition, page 341. ^ Speech to the Second Gelug Conference Archived 2010-04-19 at the Wayback Machine by the Dalai Lama (06-12-2000), retrieved 03-23-2010). ^ Dreyfus, Georges. The Sound of Two Hands Clapping The Education of a Tibetan Buddhist Monk, 2003, page 108. ^ Dreyfus, Georges. The Sound of Two Hands Clapping The Education of a Tibetan Buddhist Monk, 2003, page 118. ^ Powers, Introduction to Tibetan Buddhism, 2007, page 481. ^ "Publications from the Tibetan Buddhist Learning Center". www.labsum.org. ^ "Đại Luận Về Giai Trình Của Đạo Giác Ngộ – Lamrim Chenmo - Prajna Upadesa Foundation". www.prajnaupadesa.net. Wikimedia Commons has media related to Gelug.